Perfect Upper berth reading lamp shroud/shade from the ship. If you need one of these as a part to complete your light at home …now is your chance!. Of course, these were all made from aluminum … light weight and fireproof! Excellent condition! 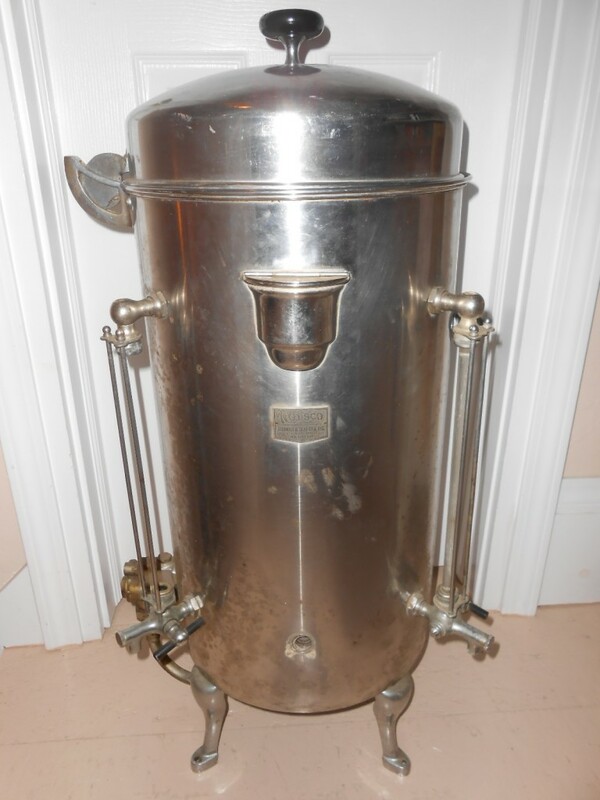 United States Lines: SS United States Galley Coffee Urn: Repriced and relisted ! OHHH MYYYYY WOW … here is another one of those rare and unique items. I brought this back from a recent trip out West … One of the Coffee Urns from the ships galley. 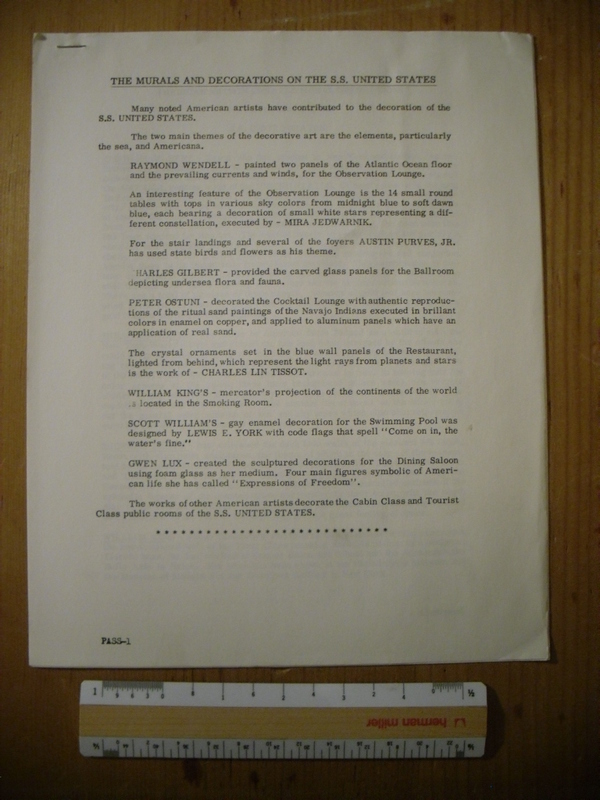 I believe this came from the galley that served First and Cabin class dining rooms… and is pictured in the SS Guernsey’s auction catalogue (Wednesday 10/03/84). This was of course steam driven (manufactured by RUDSCO) and is complete as far as I can tell! It comes with various glass replacement parts as well. I was told this can make 144 cups of coffee at a time … great for your SSUS bashes! Solid construction and expected condition from preparing a lot of coffee … still has a faint and rich percolator smell. Wonderful pristine and famed cutaway for the SSUS. There were several versions of these … this one appears to be from the mid-1950’s. One side is all cutaway … the flip side has b/w interior and “activity aboard” photos. Lots of fun facts about the ship … and a small info section on the famed Hales Trophy! You could not ask for a better overall item about the ship! 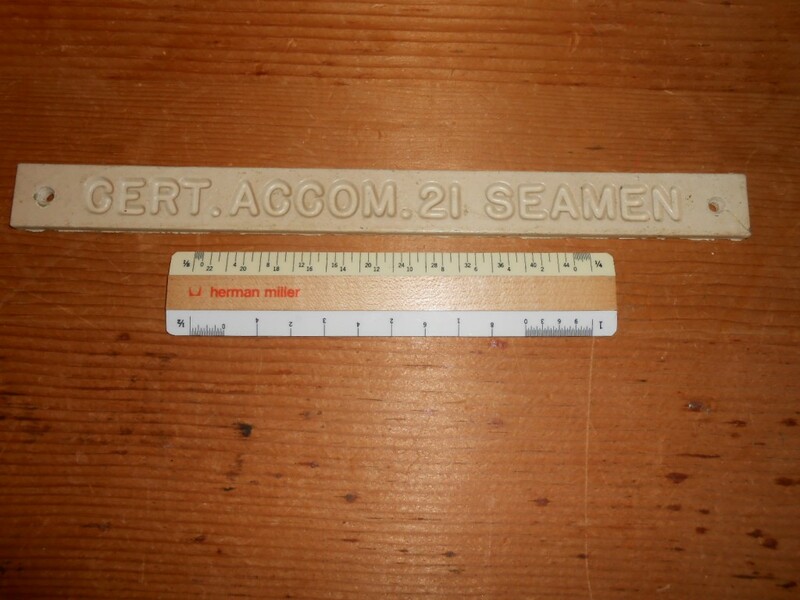 Cast aluminum crew signs for the ship like this seems to be pretty hard to find …. Probably because the other signs were much easier to locate and a little more “glamorous”. 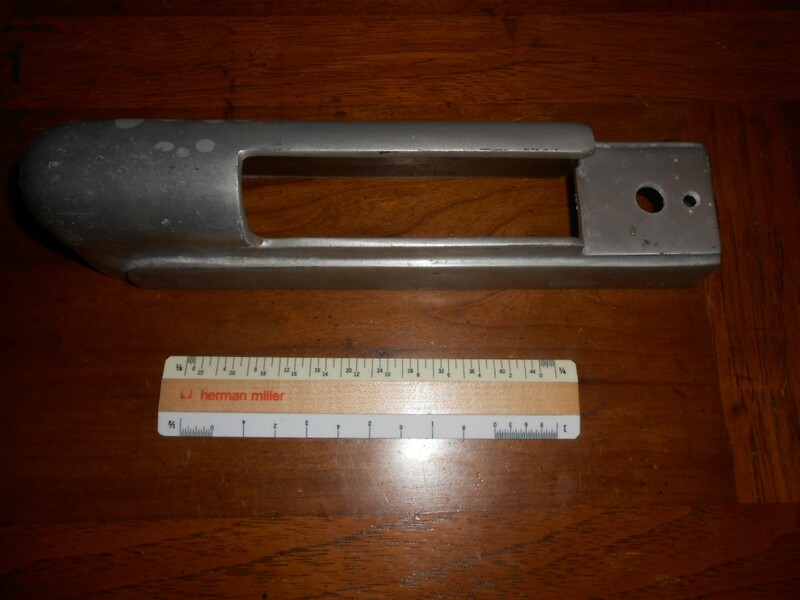 This is a cast molded piece .. of course out of lightweight Aluminum. This particular crew cabin would have been certified as being large enough for 21 seamen to occupy (who would have slept in Aluminum standee type bunks). Can you image all those seamen crammed into one room? Pretty rare to find these! 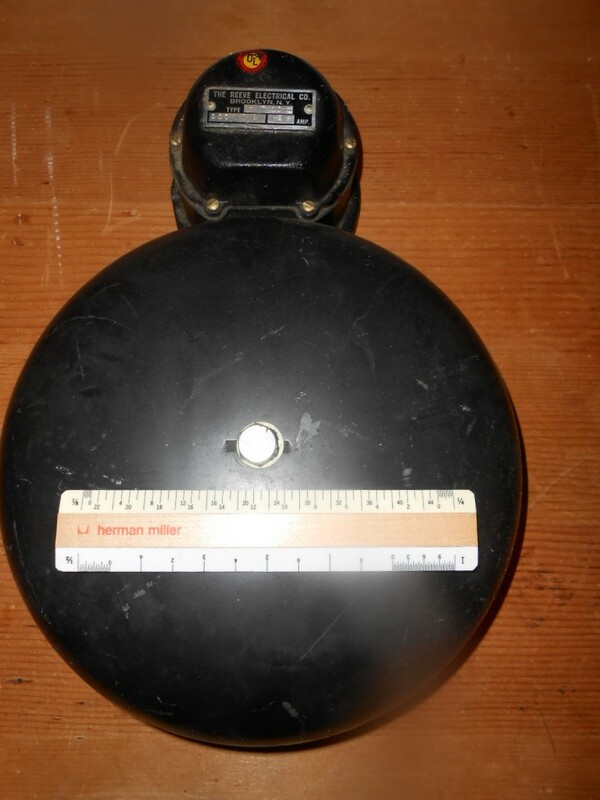 An Alarm Bell removed from the beloved SSUS. Gibbs had an absolute creed for Safety … and this bell was part of the ships emergency warning system.. These Bells were placed throughout the ship and can be seen in various photographs ..Holy Cow is this darn thing loud and HEAVY!! … When these went off, they could wake the dead (watch out for SSUS Zombies!!). Excellent condition! I may have to quote shipping … this is heavy! Use this as a doorbell… and you’ll never miss another caller. 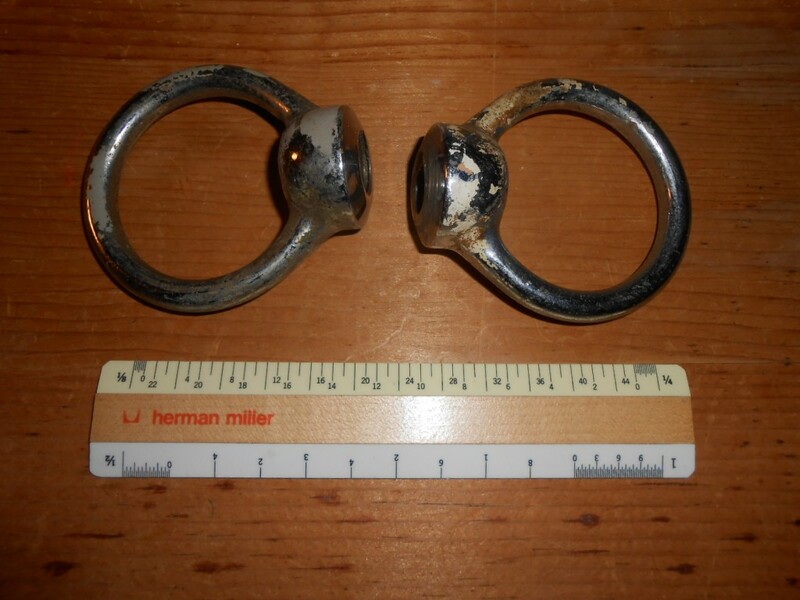 Another hard to find item for the great SSUS … a pair of porthole lugs. I know there were at least 2 kinds of lugs on the ship … chrome covered ones like these that were in passenger/ public areas .. and brass lugs used in crew parts of the mighty ship! I remember last time I was on the Big U most of the portholes on the ship were locked so tight you would could never get them open (remember she was sealed tight by MARAD when she was laid up). On the QM today, they have welded a little dot-stop to the end of the porthole screws to keep souvenir scavengers from removing her solid brass lugs. A gem of an item … and a set that made every single service crossing! United States Lines: SSUS Porthole glass! Ok … this has to be a RARE one …. 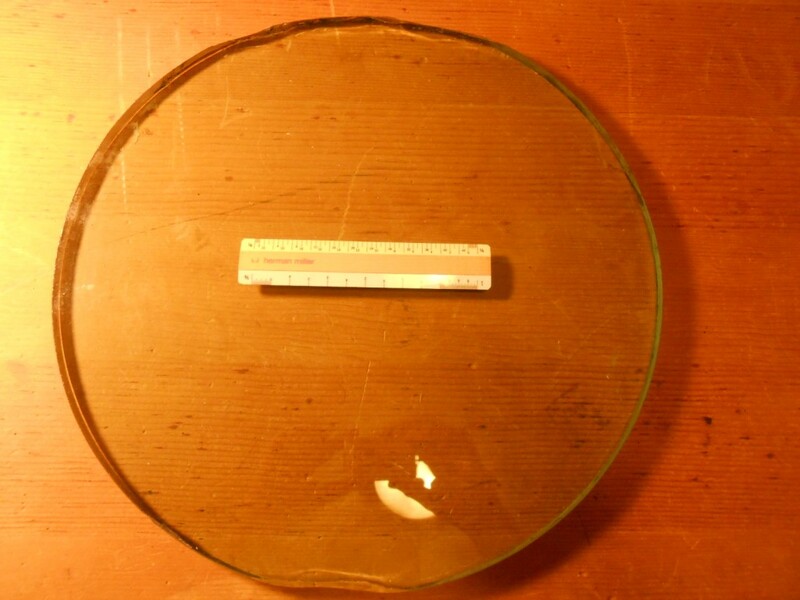 A replacement piece of porthole glass! I am sure there are stories it could tell! This could have been kept onboard in the “maintenance’ supply area to be used if there was a porthole that needed replacing.. but it sure looks like it could have been installed at one time as well. This baby is HEAVY .. and parts of the edges are “chipped” .. they almost look scalloped on purpose. The SSUS had pretty small portholes .. I am sure they were Navy standard for safety! There can’t be too many of these around! This may require special packaging and shipping and I dare say will be too heavy and fragile to ship internationally. Here is an unusual and utilitarian item from the ships galley/scullery … a silverware basket. 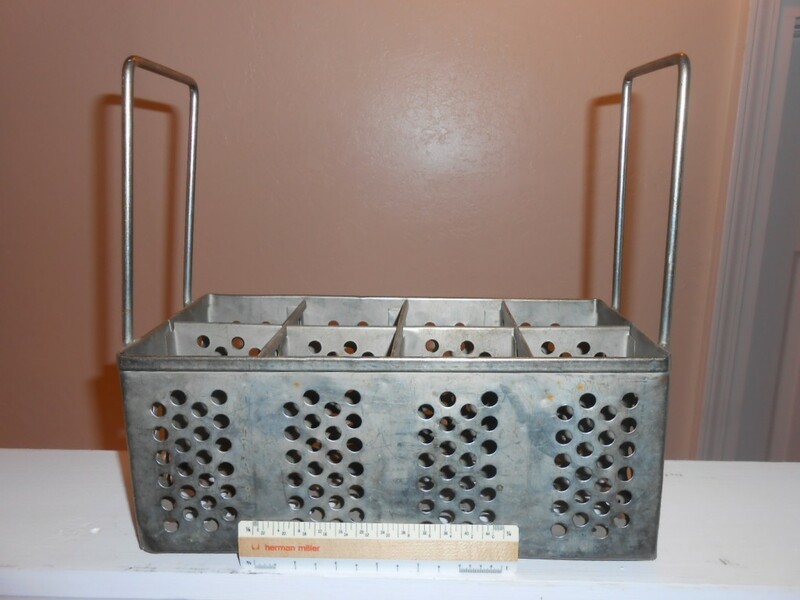 Just like what you have in your dishwasher today … but of course a little more robustly built for “industrial use”.. can you imagine how heavy this basket would have been with Manhattan patterned silver utensils stuffed into each of the 8 basket sections? In great condition considering the 17 years of hard use! A unique item for sure. These are lovely examples of just how detailed items designed and made for the ship were. First they were of course we made out of Aluminum … so they were light , fire resistant and required no real cleaning etc. Also ingenious was the “toothed” bar … which kept towels for falling off with the various movements of the ship. 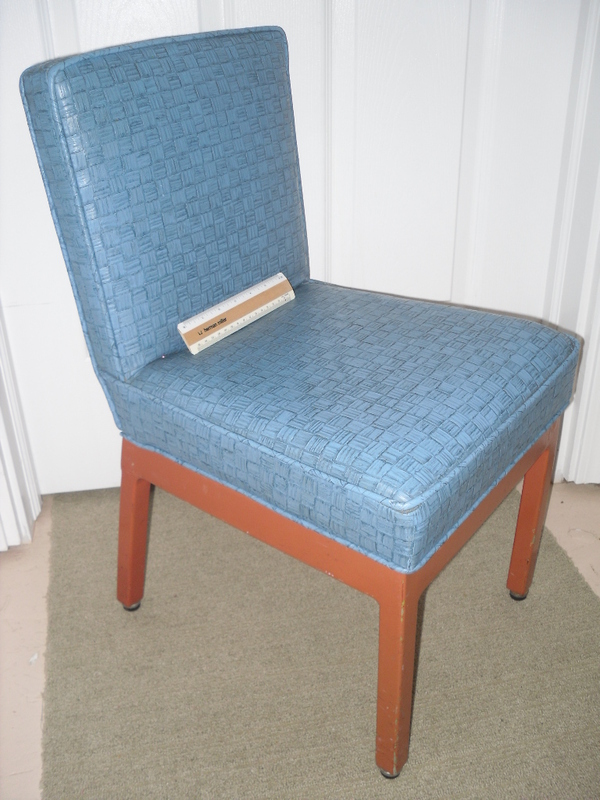 These were customized and “cut down” as dictated by the individual bathroom space. 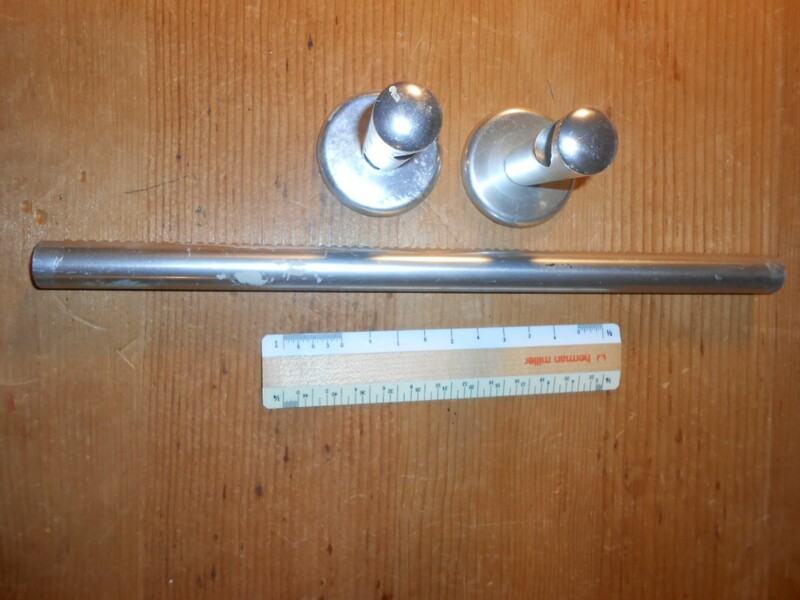 Approx 12″ long. Comes with some cabin paint marks too! 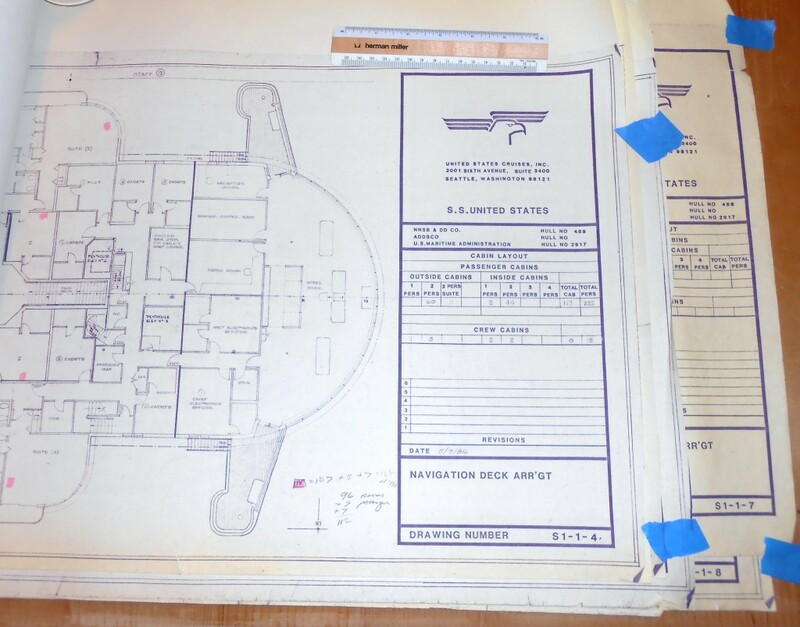 OUTSTANDING set of original blue line SSUS conversion plans for Hadley’s dream that was not to be! 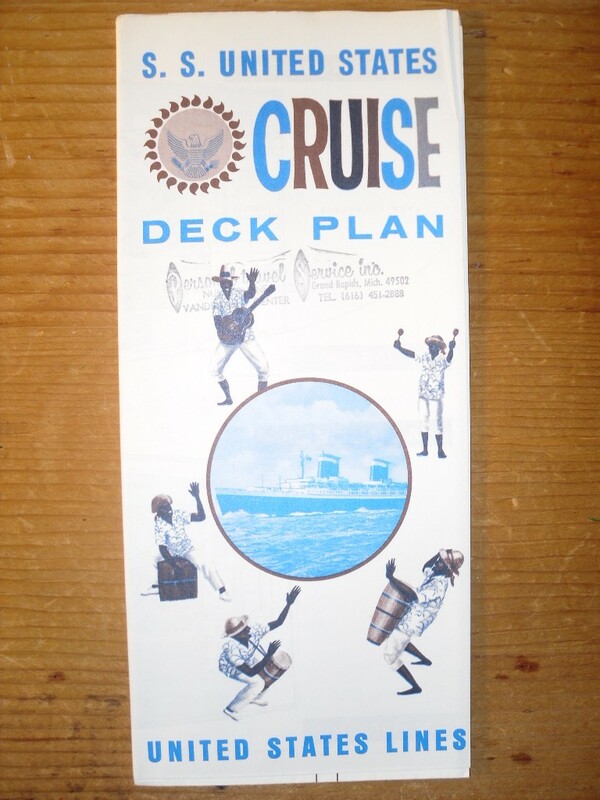 This is a complete set from the last 1986 plan revision that covers all new and old decks (Observation/includes stack profiles, Eagle, Navigation, Sports, Sun, Promenade, Upper, Main, A,B,C, D and partial E, Hold and Machinery) and also includes the coveted outboard profile drawn at a smaller scale. I can pour over these plans for hours at a time and dream about what could have been! There are minor marks and notations on the sheets and most have small edge tears … but these do not affect the “drawing” portions of the plans at all. The promenade deck sheet is missing a corner of the sheet. Amazingly, Some of these giant sheets reach into the 10 foot long range! Certainly a conversion of this magnitude would have altered the SS United States well away from her mid-century design and made her less desirable or maybe even impossible for us to debate her preservation today …. but she certainly would have had more useful years on the ocean. These plans are priceless tools for research and or model building and are becoming rarer and much more obscure to find …. Certainly a true collectors dream item. I have to admit, I am not a tableware collector … but I do like the greystar china that was designed for the USL ships. 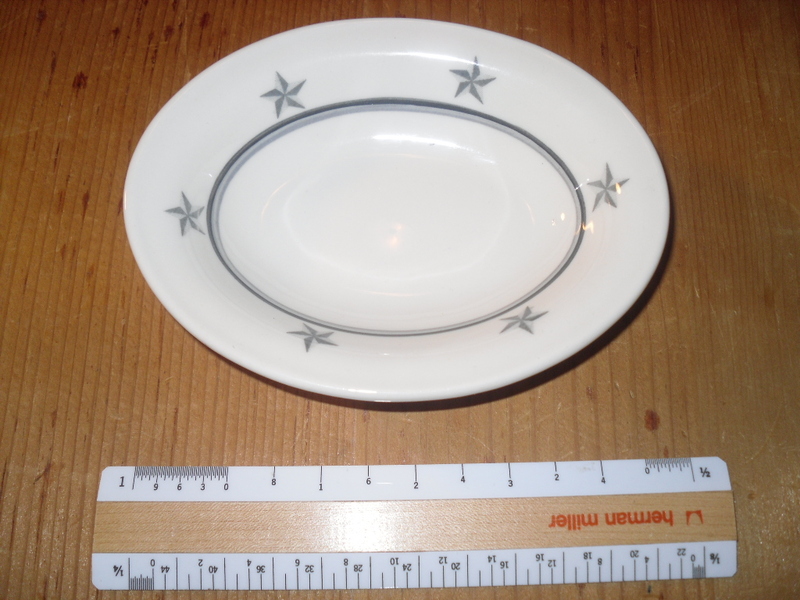 These are nice oval bowls … used to serve smaller side dishes. Since they are stamped Lamberton … they date from the 1960’s (Mayer china dates from the maiden voyage and through the 50’s). Excellent condition! United States Lines: Art Onboard Mimeograph: Restocked! Pristine Art Onboard Mimeo for the SSUS. I found a locker full of these babies when I was onboard in 1991 … and a few of them are now available here on GLL. I was so lucky at 21 and 22 to be able to roam the Big U’s innards and explore her glory. I will never forget those lucky summer days! These 5 page mimeos cover most of the art onboard the SSUS … and are in great shape. The dehumidification units installed by MARAD were chugging when I was onboard … and they did their job well. Oh my … here is a rare one! 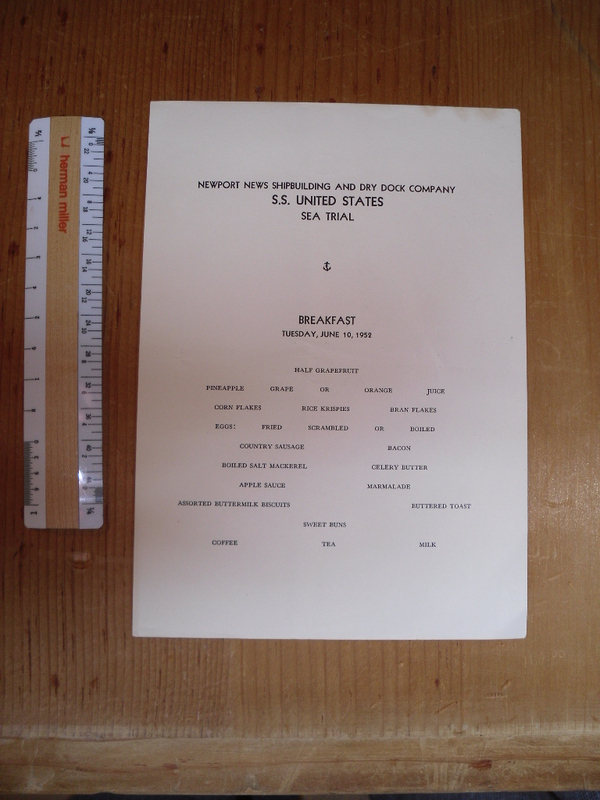 A paper breakfast menu from the 2 day of the Big U’s trial trip sponsored by NNSBDD. All sorts of folks (certainly mostly men) were aboard running the ship through the paces of the Virginia coast. Based on her outstanding performance, Gibb’s would have had a smile on his face the entire time. Nice shape … certainly rare… and probably best shown framed. Please help save the SS United States, visit www.savetheunitedstates.org. 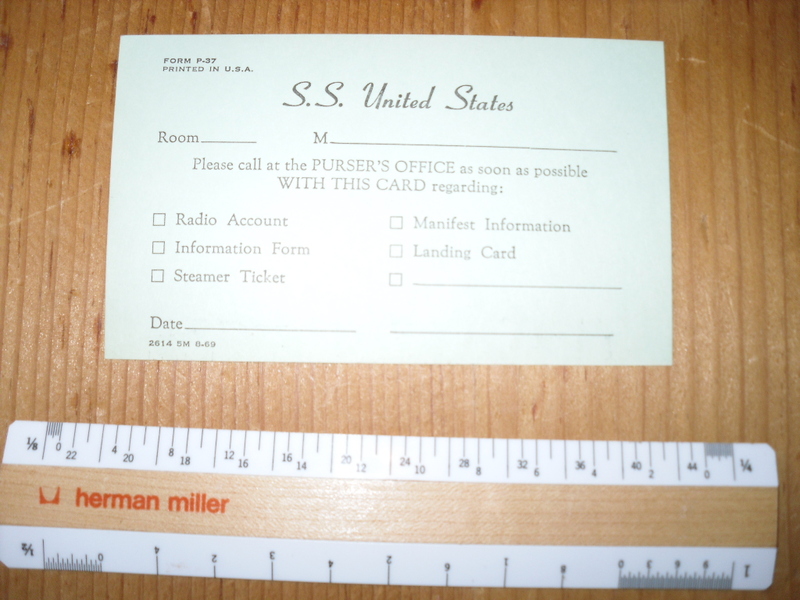 Another item I was allowed to have on my last visit to the SSUS in the summer of 1991 were these Pursers cards. I remember finding them stacked neatly in a file drawer in the pursers office … while the floor of the office was covered with multitudes of other paper products. These cards were used to communicate with passengers for things like landing arrangements, radoitelephone account , and other daily requirements. Looks like these were printed in August of 1969 … close to the end! Please help save the SS United States, visit www.savetheunitedstates.org. Oh, Hadley’s dream that never came to pass! 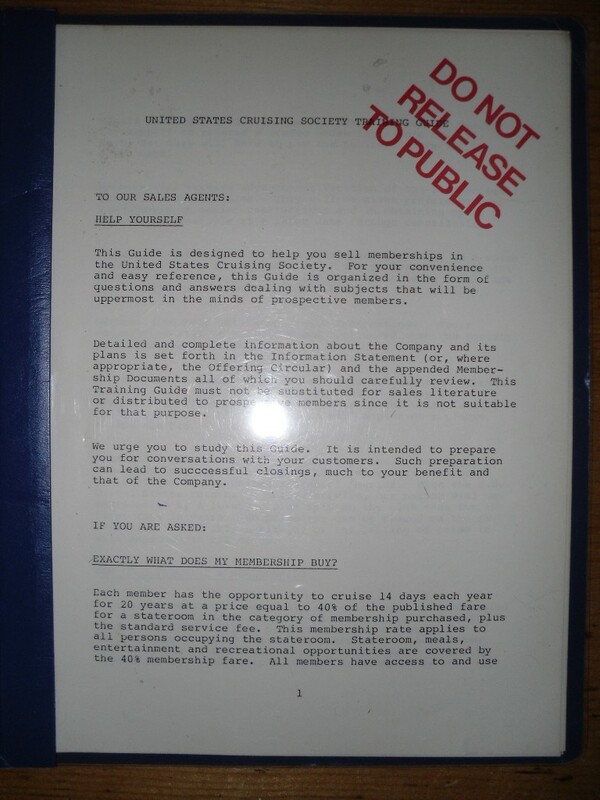 This is an orginial 15 page mimeographed guide on how to sell cruising society memberships for the reconditioned SS United States. Answers to about 30 questions in FAQ format. One question confirms her homeport as Honolulu. Never saw another one of these! Please help save our national flagship: www.savetheunitedstates.org. 10 Percent of all SSUS sales from GLL are donated to saving the ship. 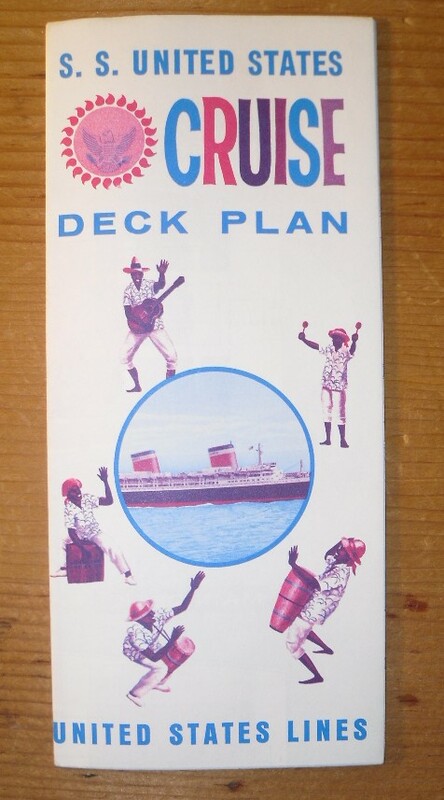 United States Lines: SS United States Miniature Cruise Deckplan Restocked ! 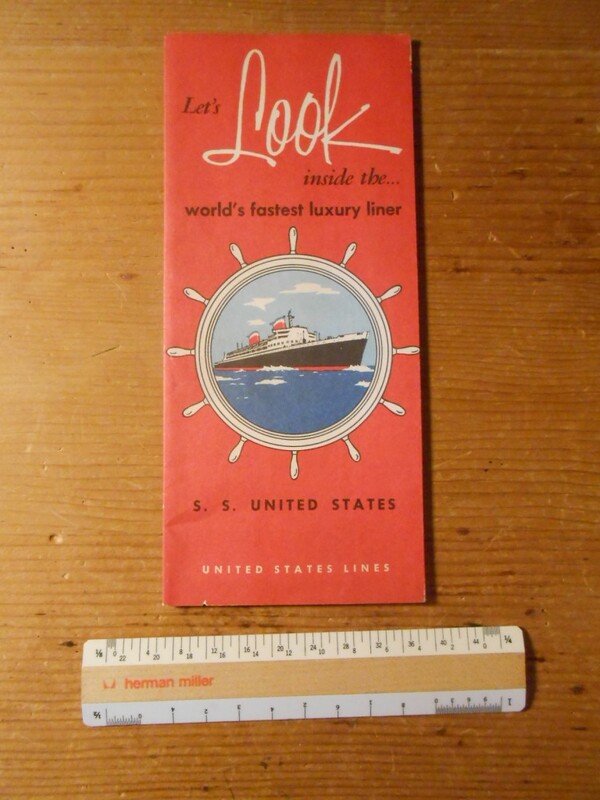 United States Lines: SS United States Miniture Cruise Plan restocked ! 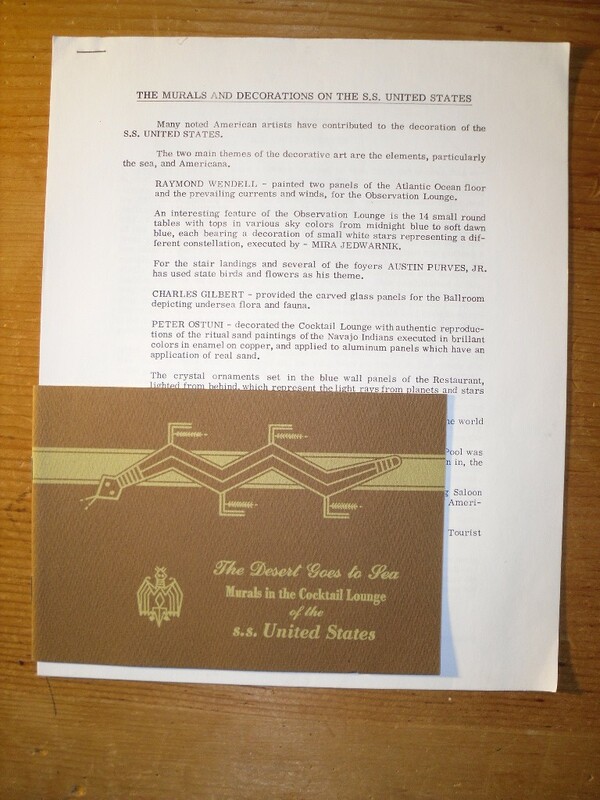 United States Lines: SS United States Art Onboard mimeo and Navajo booklet: restocked! SS Unites States: A hand typed onboard produced mimeograph list of her artwork and artists paired with a Navajo Lounge booklet. I found these items stashed in a locker next to the tourist class child’s playroom on my last visit to her in 1991. The MARAD dehumidification units still were chugging … these items don’t show any discoloration … though slight rust to the staples. Please help save the SSUS!